I've been looking forward to Thor: Ragnarok for a long time now. While I enjoyed the first Thor film, I liked Thor: The Dark World considerably less, as did most people. So out of all the Marvel franchises, Thor has been my least favorite. But ever since we got the first trailer for Ragnarok, that tune seems to have changed. That first trailer is still undoubtedly my favorite trailer of the year. It was incredible, making great use of Immigrant Song. Everything about it was heart-pounding, intense, and funny all at the same time. 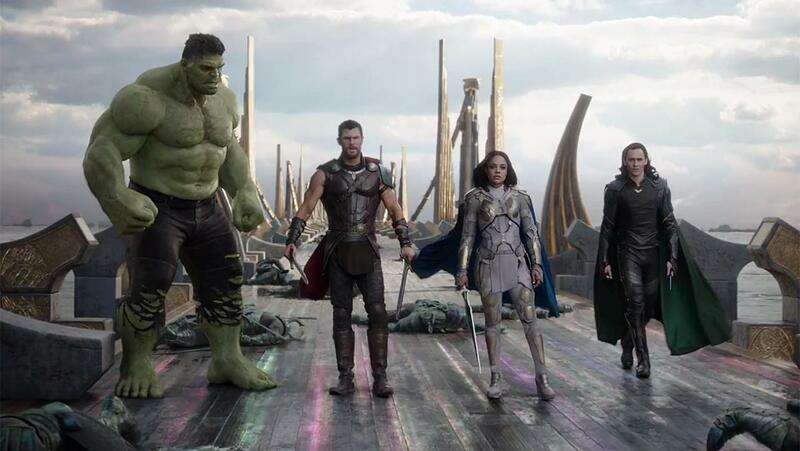 Ever since I saw that trailer, I've been through-the-roof excited for Ragnarok. And with the reviews that have since come out, my excitement for the film has only increased. Everyone is raving about this movie, so I went into the theaters with really high expectations, wanting a great mix of action and levity. And I was surprisingly disappointed. Though I am clearly in the minority, I found Thor: Ragnarok to be ridiculous, and an extremely underwhelming departure from the Marvel movie formula. With the impending destruction of Asgard, Thor (Chris Hemsworth) must escape his imprisonment upon the planet Sakaar, enlisting the help of his fellow Avenger, the Incredible Hulk (Mark Ruffalo). This is a similar case to Dunkirk where I do not see why people love this movie as much as they do. With Dunkirk, I was a lone voice against it. At least here, I saw the movie with people who ending up thinking the exact same way about it as I did. Director Taika Waititi takes the character in a drastically new direction, which wasn't exactly uncalled for. Like I said before, I find the Thor franchise to be the weakest MCU series, so reinventing the character is a smart idea. But the way that Waititi transforms him, and to what extent, really took me out of the movie. Thor is a bumbling moron in this film. He is not in the least bit competent. He's always cracking jokes, or tripping over something. It's slapstick comedy for a character who had previously been established as being a rather serious person with bits of comedy. But this was all comedy, to the point where it felt like an SNL parody sketch rather than a genuine movie. I did not believe for a second that Thor was capable of doing anything, because they made him out to be such an idiot. I appreciate them trying to adjust the character, but it felt more like an elseworld, Taika Waititi fan film than an actual Thor movie. And Thor isn't the only character parodied. You have the Hulk, who they have aged up in terms of his developmental skills. He can talk now, which I liked, but they also make him act like a baby too, which made me completely unable to take him seriously. With the two of them together, when it came time for them to fight, it looks cool, but there are no stakes behind it, because I could not take them seriously as characters at all. The blending of real actors with the green screen was absolutely atrocious. It was incredibly obvious that these actors were not in their pictured environments. The CGI isn't necessarily bad on its own, but as soon as it blends with the real actors, it looks terrible. There was one practical set that looks really cool, but it was only one out a dozen different locations. Either Marvel has to increase the budget so that they can make the visual effects look better, or they have to go back to using real locations and building sets, which frankly is cheaper than doing extensive CGI. The story is also completely convenient for the characters to move from one scene to the next without any kind of logical, cohesive binding. Something will be revealed at the end of one scene that allows them to go right into the next scene, even when the reasoning behind it makes no sense. Cate Blanchett is absolutely wasted as Hela. Marvel usually has an issue with their villains, but she is one of the greatest actresses out there. I thought by having Blanchett that they would give her a better role, but she ends up being exactly like every other MCU villain. There's no depth to her, she's there only to be evil, and she gives giant exposition dumps. Maybe I wouldn't be as disappointed with the character if it wasn't being played by Blanchett, but I'm rather angry in the way they handled her. The Clancy Brown-voiced Surtur is also completely useless, and honestly adds nothing to the movie. 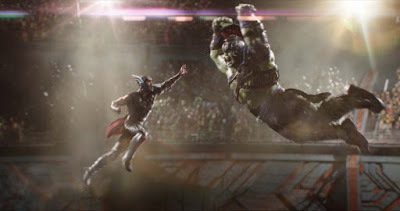 This movie also incorporates part of the Planet Hulk comic book storyline, which is one of my favorite graphic novels. It is really a great story, and one that is rich for a cinematic telling. While I was initially disappointed that we were getting Planet Hulk in a Thor movie rather than it getting its own movie, I was excited to see what they would do with it. And I was very disappointed. They keep the gladiatorial element of it, but that's about it. From the comic, you also have Korg, who is played by director Taika Waititi, and Miek. But they had nothing to do with their comic book counterpart. Now, I don't mind if comic book movies cherrypick elements of a certain comic run, as long as it works. X-Men: Days of Future Past was nothing like the comic book, but I didn't care because it was a good movie. But Thor: Ragnarok isn't, and it makes all the ways that it squanders the Planet Hulk comic all the more noticeable. Korg, who is a strongman kind of right-hand-man to Hulk is made out to be a joke. And Miek, who has a tragic but powerful backstory and character arc in the comic, is not even a character! He's just a non-speaking alien thing that Korg carries around and occasionally references to. This was us finally getting Planet Hulk in the MCU, which I have been beyond excited to finally see, and it was ruined. It sounds like I absolutely hated this movie, and that's not the case. There were certainly redeemable parts about it. The way that Led Zeppelin's Immigrant Song is incorporated into the movie is incredible, and they are easily the best parts about this movie. It opens with one of these sequences, so I began the movie on an adrenaline-pumping high, but then it went downhill from there. I like that they made changes to the Hulk. He's redesigned to look closer to Mark Ruffalo, which makes a lot of sense. I also like that he could speak. These were good ideas; I just didn't like all the other stuff they did with his character. While a lot of the side characters in the movie are useless and come off as just being ridiculous, I actually didn't mind Jeff Goldblum's Grand Master. I think the style of comedy works best for his character than any of the others. And I also like the overall story. I think it is a really good story that can work, but I just thought the way it turned out as a movie wasn't all that great. 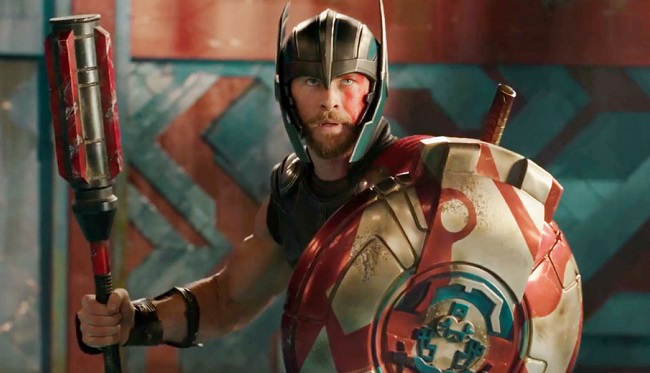 Overall, Thor: Ragnarok was an underwhelming let down. Taika Waititi has said that 80% of the dialogue is ad-libbed, which makes complete sense to me, as all of the dialogue was pointless bantering that adds nothing to the story. They make a mockery of the Thor character, who has essentially been turned in Deadpool. He comes across as a parody of Thor, rather than actually being the Thor we know from the other four films he has popped up in. Hulk has also turned into a ridiculous version of himself, which I found to overshadow the good changes made to his character. 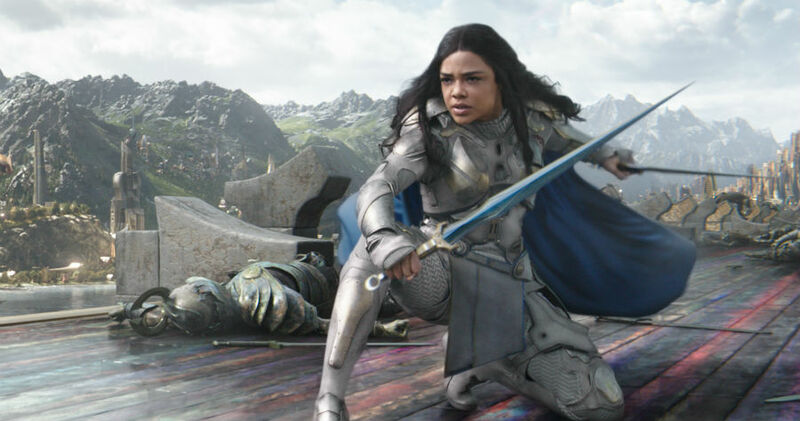 I really like the introduction of Valkyrie (Tessa Thompson). She has some great action scenes, and some interesting characterizations. I also think that, while Loki (Tom Hiddleston) has some jokes, his character is still rooted within a grounded seriousness, which I found the opposite to be with Thor. I think the action sequences are well choreographed, especially the parts that incorporated Immigrant Song. But Thor: Ragnarok completely wastes its villains, and also gives us pointless side characters (such as Karl Urban's Skurge), who are entirely one-dimensional and don't exactly add anything to the story. The story itself, while good on paper, is rather implausibly convenient. It also tears apart the Planet Hulk comic book storyline, and does not do it justice at all. 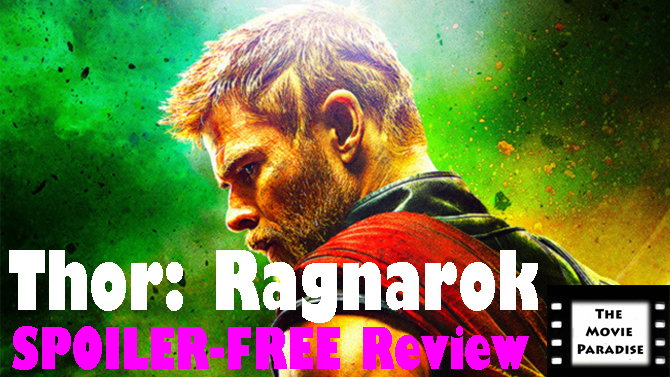 In the end, I can't say that I hated Thor: Ragnarok, because there were elements of it I really liked. But I did find it to be a disappointing entry in the Marvel Cinematic Universe, especially coming off the heels of the fantastic Spider-Man: Homecoming. What do you think? Have you seen Thor: Ragnarok? Did you like the film? Leave your (spoiler-free) thoughts in the comments section below.